Loss of customer is avoided - ACE7 has alarm or reminders about appointments. ACE7 does not Schedule 2 events at the same time. There is no question of forgetting and annoying any customer. Task Management efficient - Assign tasks or appointments to executives in the field – they receive task details through email on their mobile. Survey Management - Design an intelligent survey and execute using contact management tool ACE7 through auto dialer and acquire new clients and new business. e-mail Campaign - Email Campaign is a very essential tool for any business. You can use contact management tool ACE7 as a tool to send targeted campaign. Letter Campaign - Emails may go to junk folders but letters get the attention of contacts. Use Contact Management tool ACE7 as a targeted group letter campaigner. Track expenses - Contact management tool ACE7 helps maintaining date wise expenses for each contact, to know which contact is not profitable. Business Management - ACE7 provides management of Contacts, Products, services, employees, vendors, invoice, survey, campaign, sales funnel, workflow, documents and expenses. Implement sales funnel - Sales Funnel management can be easily implemented by segmenting contacts and grouping in ACE7. 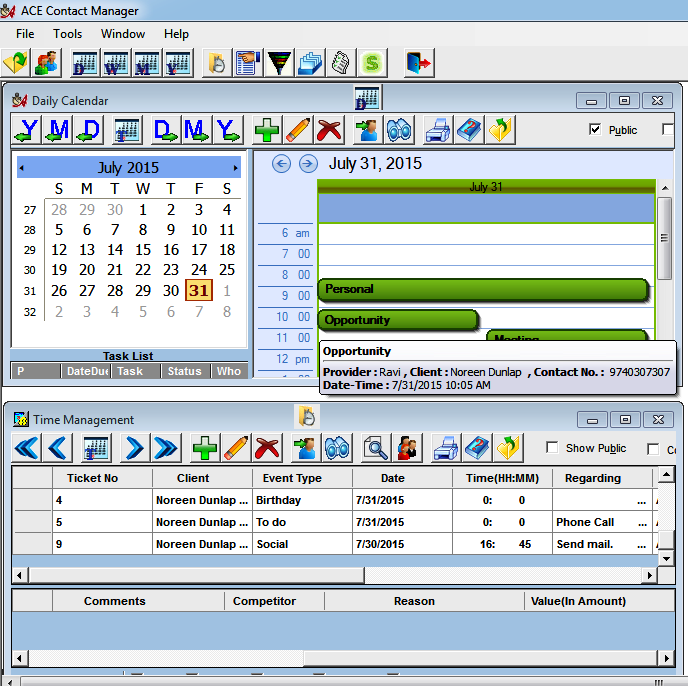 Ease of use - ACE contact manager is so easy to use that you do not need any training and separate administrator. Flexibility and Customizability - Fields on Contact management screen can be changed by user in their own language by right clicking. Implement Workflow - Workflow module in Contact management tool ACE7 helps involving any executive by sending task details by email, even if they are not users of ACE7. Document Management - Contact wise document management is an added benefit to share between sales executives at different locations. Minutes of the meeting - Minutes of meeting is stored date wise in the memo area on contact management screen. On premise data security - There is an in-built engine to implement the email campaign to your target group of customers.